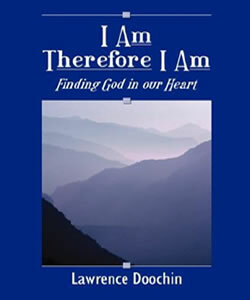 "I Am Therefore I Am" is about finding God's Love in our heart. We were created out of Love, so that God as Love, could know Himself, could know Herself. The book consists of revelations that were given to author Lawrence Doochin as part of a long emotional and spiritual journey. The revelations show the reader what is behind appearances and belief, what is faith, what is the Will of God, what is the meaning of life, and most importantly what is Love. The reader is reminded throughout the book that everything that happens here in this dream is meant to bring us back to a remembrance of God's infinite Love for us and our Love for Him. Do you need some answers from God? Is it sometimes hard to hear Him talking to you with all of the static of the world? Do you desire to know the Truth about yourself and how to look at your "problems" in a completely new way? Modeled after the very popular The Divine Speaks website which has had hundreds of thousands of visitors, "The Divine Speaks Volume 1" consists of statements that were given to the author Lawrence Doochin, covering a number of subjects on life, Love, and God. These sayings provide a common sense but profound of way of looking at our experiences, why we take certain actions, how are beliefs shape our reality, who we truly are in relation to God, and how we can make significant changes in our life. Just as the website presents a "random" statement that is exactly what you need to hear, you can use The Divine Speaks in the same way by randomly inserting a bookmark and getting a statement. In the body of God, there are no coincidences, so you will get exactly what you need, even if you don't understand it at that time. If you desire to grow and be able to look past the surface appearance of this increasingly insane world, if you desire to be emotionally and spiritually authentic, if you are searching to truly find peace, this is the book for you. We can only feel peace and joy to the extent that we are healed of traumatic experiences and the false beliefs that were created from these experiences. Whether it is recognized or not, almost everyone has experienced some type of trauma in their life. This could range from the horrific experience of sexual or physical abuse to the simple recognition that one's parents were not very loving or that they placed conditions on their love. Are you completely happy with your life? Is it working the way you want --- is it one of ease or difficulty? God intends for us to live a joy filled life, and if you are not, this is the book for you as it will reveal the underlying patterns and beliefs you hold but most importantly how to release them. The 13 steps are written very concisely, but the healing power and logic of the author's words is very evident and will help you see yourself and your past in a completely new light. Lawrence Doochin had a long journey of healing from sexual abuse, and his insight on how our emotional healing and spiritual journeys are closely intertwined is unique. He gives the reader not only the steps and awarenesses needed to lead a life filled with joy, peace, and ease, but also the knowing that meaningful change can and will happen if they desire it. This small gem can also be a great gift for those you love to help them on their healing journey. "I would highly recommend Lawrence Doochin's book, I am Therefore I am. Its profound messages and words offer refreshing clarity, wisdom and compassion at a deeply intimate level. Instead of more how-to instruction, Doochin's small but powerful book feels almost experiential. As such, his words seem to open my mind and heart as I read them." 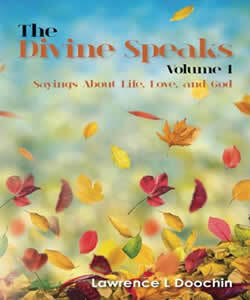 The Divine Speaks: Sayings About Life, Love, and God (Volume 1) is POWERFUL. I cannot recommend highly enough for anyone mindful of their own journey or looking for a different perspective on the unexplainable forces in life. Accessibly written in short, deeply resonant sayings, the foreward says it all: flip to a random page, and you WILL find what you need. 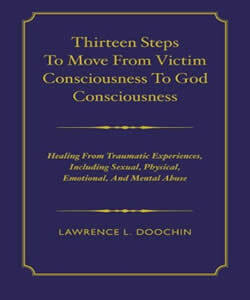 Thirteen Steps To Move From Victim Consciousness To God Consciousness: Healing Traumatic Experiences, Including Sexual, Physical, Emotional, And Mental Abuse is a great tool to add to your spiritual tool box! A true gift from the inner spirit of Lawrence Doochin. His soulful insight and wisdom offers a blueprint for healing of the heart and creating a higher connection. A go to guide for all of life's challenges.